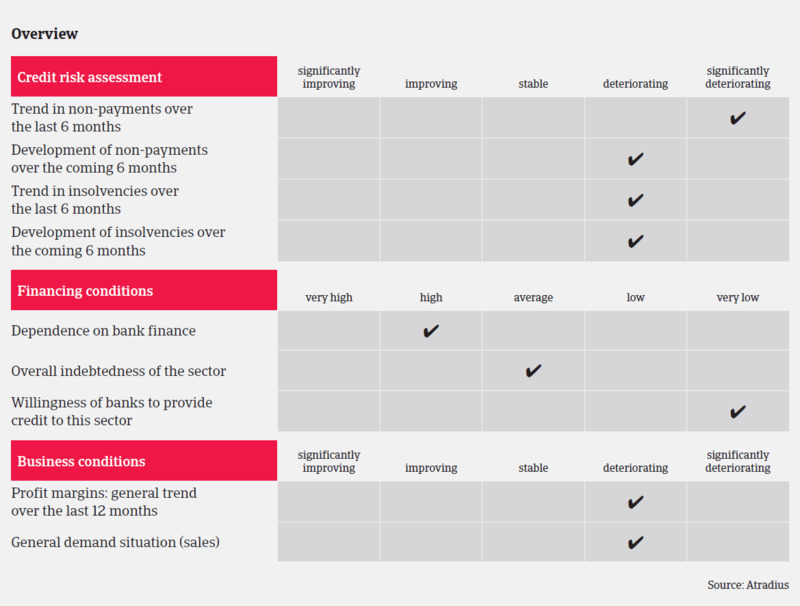 While French business insolvencies are forecast to level off in 2015, it is expected that construction business failures will further increase due to the low economic growth forecast for France. In 2014 the performance of the French construction sector deteriorated compared to 2013, due to a sharp decrease in housing starts and permits, postponement of public works due to municipal elections and the failure of the Duflot tax exemptions program to boost real estate investments. According to the French builders association FFB (Federation Française du Bâtiment), construction output decreased 4.3% in 2014 (in December 2013 the forecast had been a modest 0.4% contraction). In the residential construction subsector, new housing starts decreased almost 10% year-on-year in 2014, mainly due to a sharp deterioration in the one family dwellings segment (down 12.9%), while permits decreased 9.7%. The real estate sector also recorded deteriorating sales. Mainly due to the decrease in new housing starts finishing work activities continued to suffer, with activity decreasing 1.5% in 2014 after a 3% slump in 2013, according to the trade association CAPEB (Confédération de l’Artisanat et des Petites Entreprises du Bâtiment). Renovating activities decreased 0.5%. It is worth noting that that renovating activities and new housing account for 55% and 45% of the residential construction market revenue. At the same time the non-residential construction market did not fare much better, as new building starts in this segment decreased 10%, mainly due to less construction of private offices and public buildings. Permits decreased 8%. Public works were negatively affected by the March 2014 municipal elections in France, because public building activities usually grow in the year ahead of an election (as majors want to finish their projects before the vote), and decrease after the election. According to the building association FNTP (Federation Nationale des Travaux Publics), public construction output decreased more than 13% year-on-year in 2014. The construction materials sector also suffered, recording a production decrease of 4.5%. 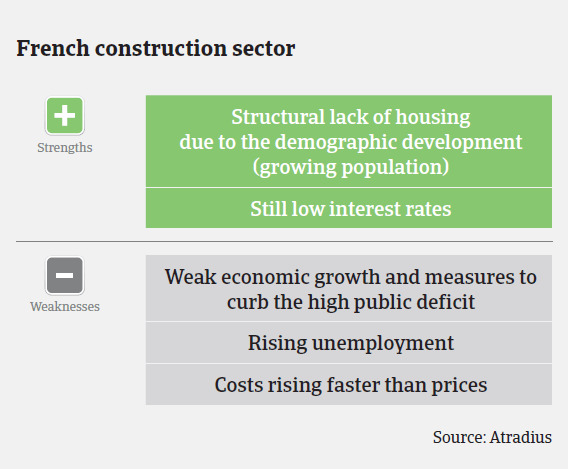 Given those figures, the poor construction performance and low demand in previous years it comes as no surprise that French construction businesses face many difficulties. Revenues and investments are low, competition is fierce, and prices and profitability are both being squeezed. Major players keep on putting pressure on their subcontractors, and banks remain very selective with their loans, making access to short-term credit difficult. Additionally, the financial situation of construction businesses is often impacted by the “scissor effect” of low margins and long payment delays. Since July 2014 we have registered a significant increase in notifications of non-payments in value as well as in frequency, and we expect this trend to continue in the coming months. Construction insolvencies account for more than 30% of all business insolvencies in France, and we expect a 3%-4% increase in 2014. Mainly (about 85%) affected are smaller businesses with 1-5 employees, but we also observed more bankruptcies of medium- sized construction companies with immediate liquidation (i.e. without entering judicial restructuring process). While French business insolvencies are forecast to level off in 2015, it is expected that construction business failures will further increase in the first three quarters of 2015 due to the low economic growth forecast for France (up only 0.8% in 2015). The impact of recently passed government measures to support the sector (tax exemptions and reductions for real estate investors and first-time buyers and VAT reduction for finishing) will probably not be felt before the end of the year. In 2015 the FFB expects modest growth of 1% (to 303,000 units) and 2.6% (to 401,000 units) respectively in new housing starts and permits for the residential construction market. However, in the non-residential segment permits are expected to decrease again, by 6.9%. Public works will likely continue to suffer from poor investments: The funds allocated by the government to local authorities will probably decrease in the coming years in order to tackle the public deficit issue. In this difficult context, we must remain cautious in our underwriting stance, but we still provide cover to our customers wherever it is reasonable and prudent to do so. We closely monitor and review buyers to anticipate potential high risks to our customers. We require additional information on construction buyers (business plans, treasury plans, interim financial statements). Additionally we undertake special reviews of buyers active in the construction of single family housing and in public works. The chemicals sector ́s export share (mainly in Europe) amounts to more than two thirds of overall sales. French businesses are in strong competition with international players, especially the US.